Back when I first started sharing my recipes, one of the first was for my healthy, easy Sŭp. It’s a Tuscan inspired soup with white beans and ground turkey with pozole (or maize) and kale. It doesn’t get much easier than this soup, and it’s good for quick, healthy lunches all week. Now when I say “Tuscan inspired,” what I mean is that I was vaguely aware that white beans figured prominently in Tuscan cooking, and that they made soup with them. I took that vague idea and made an extremely simple soup that we love. Turns out, I was channelling Tuscany more than I knew. 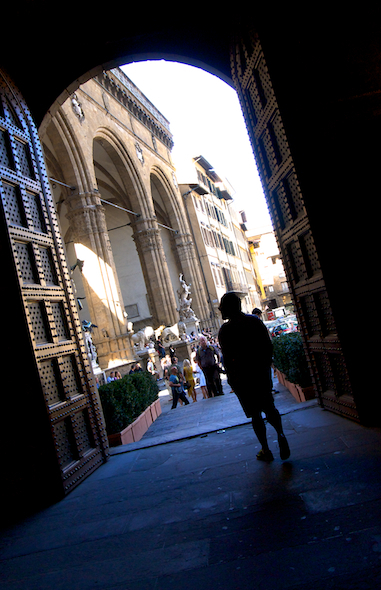 Through the door of the Palazzo Vecchio lies day one of our Firenze adventure! 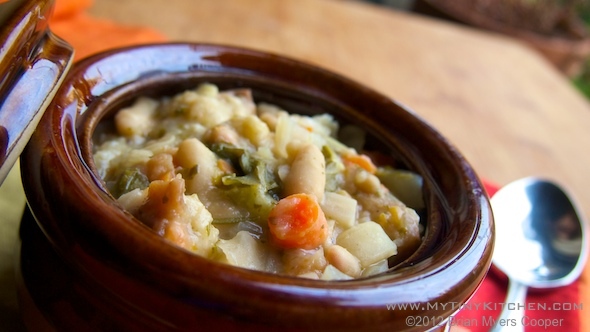 where I discovered the grandmother of my humble Sŭp: the hearty peasant vegetable and bread stew called ribollita. Ribollita was a revelation of the simple principals of Tuscan cooking: pure flavors, simple preparations and the freshest of ingredients. And the direct lineage to my own Sŭp was undeniable. I knew I’d need to make ribollita in My Tiny Kitchen and that it would become a new staple in our home. The literal translation of ribollita is “reboiled,” a nod to the tradition of adding bread and reboiling the previous day’s leftover minestrone soup. But it is certainly a worthy dish all on its own, chock full of peasant (cheap) vegetables like carrots, cabbage, beans and onion. Just like my Sŭp, its heritage demands there be leftovers, and ribollita is even better the next day–in fact, that’s kind of the point of the dish, right? We arrived in Florence in the late afternoon after twelve hours of travel including an eight hour overnight flight. We were exhausted, but we optimistically stumbled out for dinner at the venerated Trattoria Le Mossacce. We had to wait for a table at this tiny shrine to authentic Tuscan cooking, and when we were shown to our tiny half of a four-top, we waited some more. The service in Florence, while friendly, is more relaxed than in the States. They are excellent waiters, but you’ll never hear one say “Hi, I’m Marco and I’ll be your server” because they just don’t have the time. Waiters take care of more tables than is common here in the States, so they aren’t constantly popping by to see if “everything is alright.” So you’ll sometimes wait a bit to get a menu and then to order. Later in the week this was great–a refreshing change from the American approach to dining. But on this first evening, Orville and I were nearly comatose from travel and jet lag and in less of a mood for an adventure than for a quick bite and bed. We hit a wall while waiting for bread and wine, and when it finally arrived (really, it wasn’t that long, but we were exhausted), we gratefully tucked into a slice with some of the extra virgin olive out on the table. Now, Tuscans don’t eat bread like we do. They eat it with their meal, sometimes as a utensil–they call it fare la scarpetta (do the little shoe)–to sop up the goodness your fork misses. So their bread and the accompanying customs differ from what we know. First, Tuscan bread is made sans salt. It’s meant to be eaten with food and so is made to be neutral, but on its own it’s a bit flat. And since they don’t eat their bread with butter or olive oil, there is no bread plate. Undeterred, we drizzled some of that amazing oil (which is on the table with balsamic vinegar for dressing salads and drizzling on food, not for the bread) on a slice, and after one bite we both reached for the salt shaker. Typical American reaction, right? But what I found in that next bite was that this neutral bread was a terrific platform for the amazing herbaceous olive oil that we found in nearly every restaurant we ate at in the days ahead! I spent the rest of the week flouting Tuscan bread traditions in order to enjoy as much of that green, grassy fresh nectar as I could! The bread perked us up slightly, but the miles were creeping back up on us as our primi (first courses) arrived, a traditional Tuscan peasant stew called ribollita. As I dipped my spoon into that chunky goodness, I instantly felt a connection with this thick, hearty dish. It comforted my soul. The flavors of the vegetables were pronounced yet blended, and the bread that binds and thickens it was silky. After only a few rejuvenating bites, we were back amongst the living. Orville and I finally greeted our table mates, another couple of Americans whom we had horribly ignored up to this point due to a complete lack of spare energy to be sociable with strangers. Since this kind cozy interplay is part of the experience at the tiny trattorie that dot the city, I’m glad the ribollita has the restorative power to allow us to meet our neighbors–who, incidentally, were also fresh from a long flight and similarly struggling until they’d been rejuvenated by their own pasta primi, so they didn’t notice our lack of social grace. Ribollita was a revelation of the simple principals of Tuscan cooking: pure flavors, simple preparations and the freshest of ingredients. And the direct lineage to my own Sŭp was undeniable. I knew I’d need to make ribollita in My Tiny Kitchen and that it would become a new staple in our home. The literal translation of ribollita is “reboiled,” a nod to the tradition of adding bread and reboiling the previous day’s leftover minestrone soup. But it is certainly a worthy dish all on its own, chock full of peasant (cheap) vegetables like carrots, cabbage, beans and onion. Just like my Sŭp, its heritage demands there be leftovers, and ribollita is even better the next day–in fact, that’s kind of the point of the dish, right? 4 cups diced or torn stale or lightly toasted bread (1 inch pieces) – use a substantial white bread with a good crust and chewy center like ciabatta, tuscan, peasant et. al. Mass produced loaves disintegrate completely and don’t work well for this. In a dutch oven or other large pot, heat olive oil over medium-low. Add the onion, fennel carrots and celery and cook until they begin to soften, about 4 minutes. Add the cabbage, cover and cook for another 4 minutes. Add the garlic and cook until fragrant, about a minute. Add the wine and stir to deglaze. Allow to reduce for 2 minutes. Add the beans, rosemary, chicken broth (or vegetable stock), bay leaves, and the kale. Bring to a simmer, cover and simmer for 30 minutes. The vegetables should be very tender. Remove from the heat. Remove the rosemary stem and bay leaves. Add the bread and stir so the bread is saturated. Cover and allow to stand for 20 minutes. Season with salt and freshly ground black pepper. Classic Tuscan seasoning is pretty light, leaving the taste of the vegetables front and center, but you should season to your family’s taste. Use an immersion blender for two or three 2-to-3-second pulses. The resulting consistency should still be very chunky and the consistency of oatmeal. If it is too thick, thin with ¼ cup of water at a time until you get the hearty consistency you want. You can use a regular blender for this, but only put about 2 cups of the stew in the blender and give it two or three 2-3 second pulses, then return the blended soup to the pot. Serve with parmesean cheese, a drizzle of good extra virgin olive oil and a good chianti. Or better yet, chill and reheat it the next day (“reboiled,” right?) because this soup really comes alive as a leftover! It will thicken overnight, but you can thin it with a little water or broth and adjust the seasoning.